This year’s Betfred World Championship failure will particularly hurt Ding – heavily-fancied Mark Selby and Ronnie O’Sullivan crashing out early, combined with the Sheffield-based cueman’s second-round demolition of Anthony McGill, had left him as the bookies’ favourite. But the world No.3 surrendered meekly in the quarter-finals, going down 13-5 to Barry Hawkins – something of a Crucible specialist who Ding could learn a thing or two from as he looks end his World Championship hoodoo. No-one – even three-time world champion Selby – has won more than Hawkins’ 18 matches at the Sheffield venue since 2013 and he is now gearing up for a fifth semi-final in six years. The 39-year-old did the damage in the second session on Tuesday evening, winning six of the eight frames on offer to build up an unassailable 11-5 advantage. And he finished it off with minimal fuss on Wednesday morning – claiming the first two frames in just 41 minutes, getting over the line with a fluent 117 break. 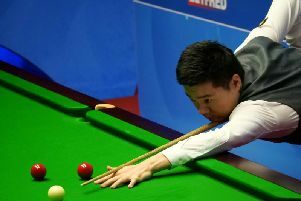 “I didn’t play well – starting with the first session, I missed too many chances to get into the black-ball area,” said Ding. “My position wasn’t good and I didn’t put pressure on him, so he punished me heavily. He’s played quite well throughout the match. “Some days you play well, some days not – maybe it just wasn’t my day. I tried to play well to score heavily but what can I say? It didn’t work. “Barry played well every frame and I didn’t play good safety to put him under pressure. I had chances but didn’t take them and he punished me. Ding must now come to terms with the fact he will be 32 years old by next year’s Worlds – well past the age by which most expected him to be a multiple-time world champion. And the old questions surrounding his inability to play at the Crucible that had seemingly been put to bed with a semi-final and a final appearance in the past two years will surely now resurface. 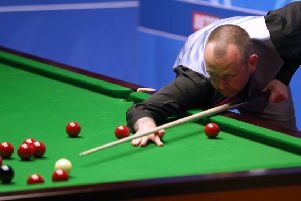 He still has plenty of time to end his Crucible curse – this season’s three most successful players, O’Sullivan, John Higgins and Mark Williams are all a decade older than him – and to his credit, Ding is keeping the faith, even if those around him are starting to lose theirs. “I still believe I can win this tournament,” insisted Ding. “Belief is belief but matches are the truth. I always get my hopes up that I can win it. “I never give up – I’m a sportsman, so I couldn’t give up against Barry. Maybe I pushed too much and put too much on myself. “I didn’t think I was favourite with John Higgins and Judd Trump and Barry – they’re all good, no-one is a favourite because anybody could win it. “The rankings don’t mean anything. The rankings change quickly – in one tournament you could go to the top, so it wasn’t important that I was the highest-ranked player left. Watch the snooker World Championship LIVE on Eurosport and Eurosport Player with Colin Murray and analysis from Ronnie O’Sullivan, Jimmy White and Neal Foulds.